This Sunday we celebrate Epiphany, a Greek word that means “appearance.” The principle appearance is when Christ first appears to the nations: when the three kings come to see him in Bethlehem. But tradition and the liturgy also connect to this his “appearance” when he was baptized and his appearance through his first miracle at Cana. Some fun connections: 1. In the East, Epiphany is Christmas. The birth of Christ is important because now he appears, he is seen. 2. There are many ways Christ appears, and to various people. 3. Baptism is spiritual rebirth; it is fitting to connect his baptism and his birthday. 4. Just as Christ turns water to wine at Cana, so Baptism turns water into the power of the Holy Spirit; the transformation of our soul at Baptism is the greater miracle, to which the physical miracles bear witness. 5. God becomes man at Christmas; man is united to God by baptism; and so marriage, feasting, and all of human life is suffused with God at Cana. 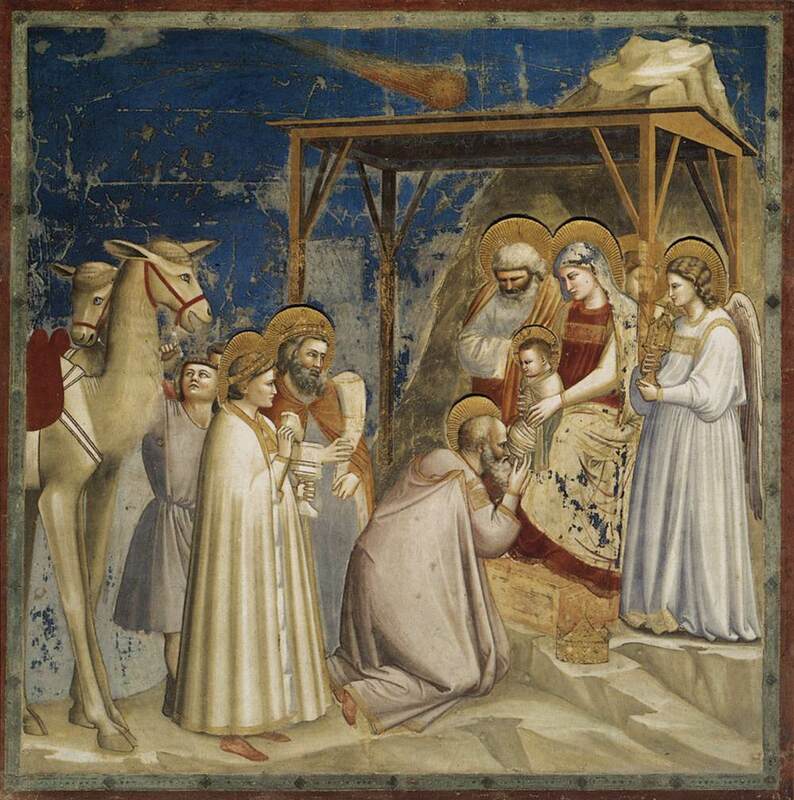 But on Sunday, our readings focus on the three kings. The reading from Isaiah shows the nations streaming to Jerusalem. But they come to Jerusalem because the Lord is there. Jerusalem becomes the rallying point. All nations are united because all come together at God’s temple. The image of light and darkness is especially nice. First, because the light comes not from Jerusalem itself, but from God above. The Church, Pope Francis likes to say, lives “the mystery of the moon.” The moon can do nothing but reflect the light of the sun. The light we have is the light that the Lord shines upon us. The Church, the true Jerusalem, is the gathering place of the nations because Jesus is here. Second, darkness is a negation. It is true that the world is full of sin. But it is more true to say that the world lives in darkness, ignorance, emptiness. Sin itself is a negation, a not, something missing. When we come streaming to the light of the Lord in Jerusalem, it is not so much to “give up” sin, which is a nothingness, but to receive the goodness of the Lord: his light, the meaning he gives to life, his goodness. Paul speaks of this “mystery of the moon” in the reading from Ephesians. First, he calls himself a “steward of God’s grace.” Both the priesthood and the universal ministry of evangelization are a stewardship. What we spread is not our light, but the light that shines on us. We have been given a great gift, a gift to be shared. We do not preach ourselves. But we do preach the gift we have been given. That requires profound humility: always to submit our minds to the teaching of Christ, the teaching of Scripture, Tradition, and Magisterium; always to depend on the power of the sacraments, not our own power; always to live the communion of the Church, never to prefer our own ways to the ways of Christ. Second, Paul says his message is “that the Gentiles are coheirs.” We come to Jerusalem. The New Testament is not a denial of the Old, but its perfection. Israel remains; the Church is Israel, the nation of God. The difference is not that we deny anything in the Old Testament; and especially not that we deny the intense national unity of the Old Testament. The difference is that now all nations are called to Jerusalem. We can all join Israel, the place where God’s light shines. The good kings lay down their crowns and their gifts before the one true king. They give up everything to come to Jerusalem and pay him homage. And so they are more properly wise men than kings: more focused on seeking his light than on asserting their authority. The bad king, King Herod, thinks Jerusalem belongs to him. He is King of Israel – and that is his downfall. Because the true King is the poor man lying in a manger, and shining with the light of God. What does the Church mean to us? How can we give up everything to come to Jerusalem and pay homage to the true king, the true light?